MANHATTAN — Kansas State University graduates continue to set records for employment rates and salaries in a wide variety of careers across the globe. According to the university’s annual post-graduation report, 96 percent of 2017-2018 graduates are employed or pursuing further education — a 1 percent increase from 2016-2017 graduates and a 2 percent increase from 2015-2016 graduates. In addition, the overall median starting salary for recent bachelor’s degree graduates rose by 2 percent to $45,000. The report, conducted by the university’s Career Center, identifies first destinations of graduates by employer, major, position titles, starting salaries, geographic placement and furthering education. It uses data from 80 percent of the 2017-2018 graduating class that was collected up to six months after graduation. 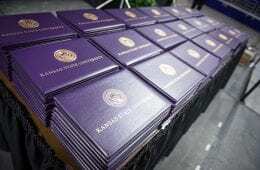 Kansas remains the top state for employment with 59 percent staying in the state after graduation and 77 percent in the five-state area: Kansas, Colorado, Missouri, Nebraska and Oklahoma. The university’s reach is broad though; recent graduates were employed in 47 states and more than 30 locations overseas. The top corporate employers by number of new grad hires are Cargill, Cerner, Koch, Shamrock Trading and Textron. Of the 18 percent of recent graduates who are continuing their education, the most common programs for furthering education include accounting, law, medicine, nursing, physical therapy and veterinary medicine. Content provided by Kerri Day Keller and Stephanie Jacques, Monday, Feb. 18, 2019. K-State students can schedule appointments with a career advisor or explore majors with a career specialist. Login to Handshake to use online scheduling or to make an appointment.